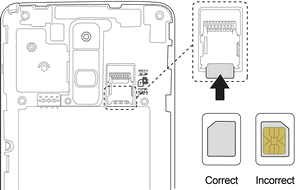 To insert your sim card, for some android devices, you will need to remove the back panel and battery. In others, you simply need to insert the sim into the sim tray on the side. Step 1 Insert the end of the SIM eject tool (included in the phone box) into the hole in the sim tray. Tip: if you don't have a SIM eject tool, you can use the end of a paper clip.